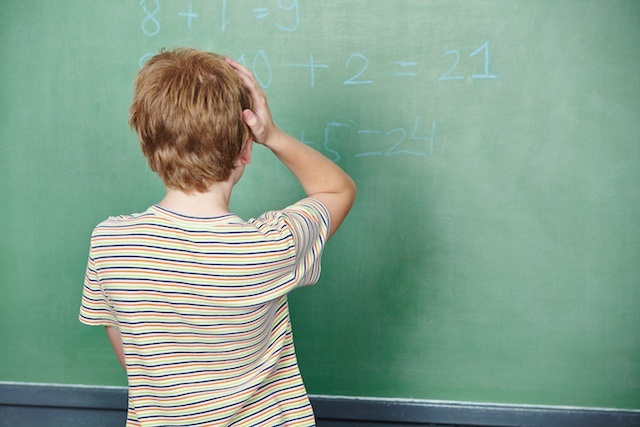 Many students struggle with math and math anxiety, but for those with dyscalculia, a math-related learning disability, math classes and tests present seemingly insurmountable obstacles that can affect academic success and lower self-esteem. People with dyscalculia have a deficit in the brain’s ability to process number-related information. They may have trouble with math operations, memorizing multiplication tables and understanding math concepts. In a broader sense, they have difficulties with sequencing information, budgeting time and keeping schedules. Grounding abstract mathematical information in the physical world can help dyscalculic students succeed. Here are five strategies for making math concepts from basic arithmetic to advanced algebra easier to understand and remember. For the dyscalculic student, math concepts are simply abstracts, and numbers mere marks on a page. Talking through a problem or writing it down in sentence form can help with seeing relationships between the elements. Even restating word problems in a new way can help with organizing information and seeing solutions. Drawing the problem can also help visual learners to see relationships and understand concepts. Students can “draw through” the problem with images that reflect their understanding of the problem and show ways to solve it. Dyscalculic students can easily get overwhelmed by a complex problem or concept, especially if it builds on prior knowledge — which they may not have retained. Separating a problem into its component parts and working through them one at a time can help students focus, see connections and avoid overload. Relating math to the practicalities of daily life can help dyscalculic students make sense of concepts and see the relationships between numbers. Props like measuring cups, rulers and countable objects that students can manipulate can make math concepts less abstract. Because dyscalculic students struggle to retain math-related information, it becomes hard to master new skills that build on previous lessons. Short, frequent review sessions — every day, if necessary — help keep information fresh and applicable to the next new task. Creating written or drawn references such as cards or diagrams can help with quick reviews. Like other learning disabilities, dyscalculia affects student success both in and out of the classroom. Study strategies that bring the abstract world of mathematics down to earth with visual and verbal cues and physical props can help dyscalculic students overcome obstacles to making sense of math. If your child struggles with math or has been diagnosed with dyscalculia, contact us online or find a center near you to learn more about how the Brain Balance Program can help.